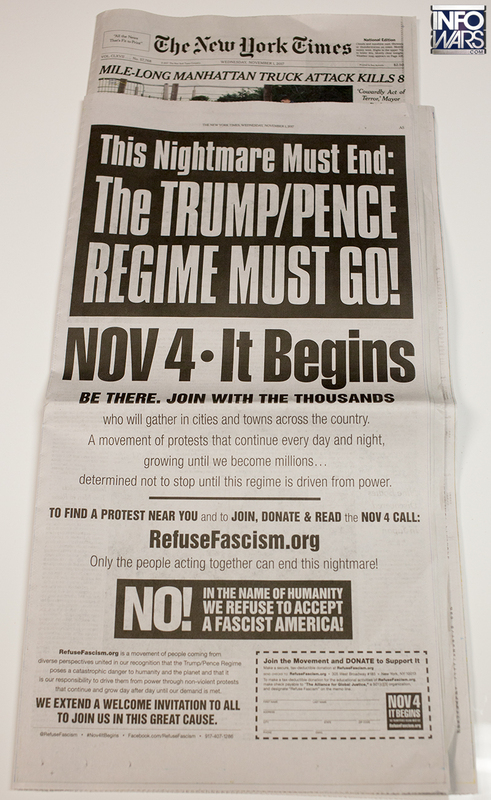 While the mainstream media still ludicrously calls antifa plans to attempt an overthrow of President Trump and thus take down America a 'conspiracy theory', the domestic terrorists themselves have just taken out a full page ad in the NY Times proclaiming their plans and attempting to raise more funds as heard in the 1st video below. The full NY Times ad can be seen below videos. 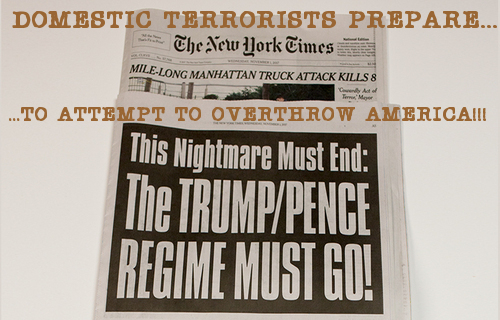 Coming soon after Project Veritas exposed the NY Times as being staunchly 'anti-Trump', do those so-called 'antifascists', who are clearly doing the work OF 'Fascists', even understand that any 'real' attempts to overthrow America will likely be met with an overwhelming and fully lawful response from pro-Trump Americans all across the country? 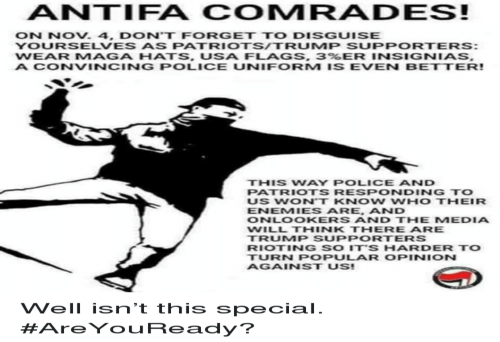 As Free Republic reported back on August 15 of 2017, so-called 'antifa', and the group 'Refuse Fascism', are actually the 'Revolutionary Communist Party's' new front groups, partially funded by Nazi-sympathizer George Soros himself. And while Refuse Fascism attempts to paint the coming 'attempt at Revolution' on November 4th as 'peaceful', all Americans need to do is take a look at what happens when 'antifa terrorists' get together in large groups - all hell inevitably breaks loose with death threats issued over the freedom to speak freely, fires set and chaos unleashed. 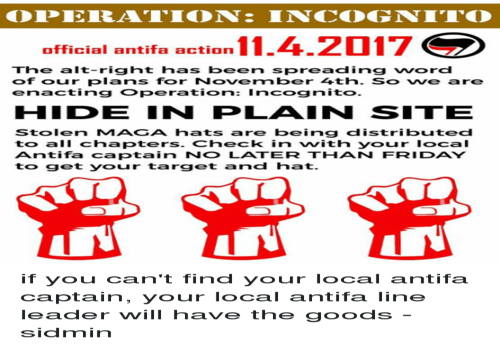 And as we see in the antifa flyer seen above making its way around the internet, antifa has now launched 'operation incognito' with stolen MAGA hats allegedly being distributed while antifa urges their supporters to 'hide in plain sight'. With continuous cries of 'crush Nazi skulls' coming from many on the left during their 'protests' as Susan Duclos reported on ANP back on October 28th, do 'antifa' and 'refuse fascism' think that peaceful, law-abiding people being attacked by them will simply sit back and allow themselves to be plundered? If that's what 'antifa' thinks the pro-America, pro-2nd Amendment, pro-Trump crowds will do, simply sit back and take a beating, they probably have another thing coming. While ANP stands strongly against the use of violence, we are also very strongly pro-self defense. So should domestic terrorists attempt to impose their violent will upon Americans (as they themselves say, they will continue to march and 'protest' until President Trump and VP Pence are removed from office), there is no doubt in our minds that Americans across the country will do what they need to do to make sure their families and loved ones are protected. The fact that a recent FBI investigation determined that members of antifascist groups here in America recently met with ISIS at the G-20 meetings in Europe to plot the destruction of President Trump proves how closely antifa ties are to international terrorists. 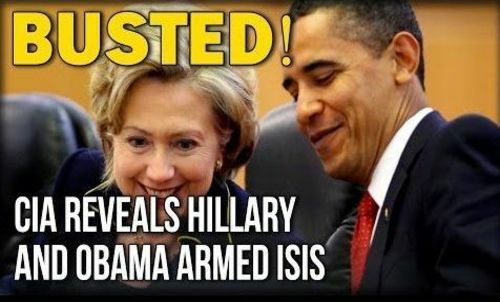 And as we've previously reported on ANP, we have absolute proof that Barack Obama provided funding to terrorist groups in Syria, a practice that President Trump put a stop to. And what of those innocent Americans who believe the lies of the msm, which claims that no such thing will be happening in November? Are tens of millions of Americans who get their news from the MSM being set up for a fall? The fact that the MSM, as well as 'refuse fascism', are continually attempting to 'whitewash' their violent plans is deeply concerning. As we recently reported on ANP, among the plans that so-called anti-fascist groups have are possibly shutting down large public areas such as malls, restaurants, office parks, roadways and who knows where their next flash mobs will spring up. 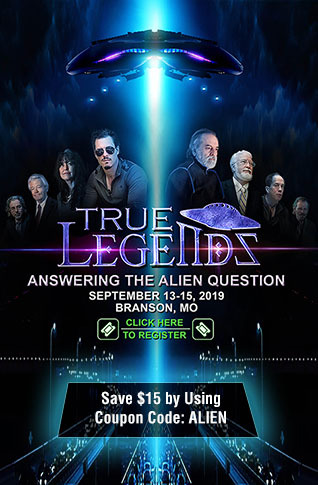 According to this October 31st story from Jeremiah Johnson over at SHTFPlan, these groups want to make America ungovernable and unleash outright chaos nationwide - just think what such a thing could mean to the 324+ million Americans living here now? The fact that the Department of Defense will be running a nationwide 'grid-down' drill on the same day as antifa's 'protests' are set to begin only serves to underscore that we could be witnessing actions to take down America from high places. As we reported on ANP back on October 26th, the DOD is preparing for a very bad day in America on November 4th and while not specifically in response to antifas plans to make America ungovernable, NOTHING would make America 'less governable' than an America suddenly cast back into the 'dark ages'. As experts have warned, the ONLY way that America can support feeding 324 million mouths every day is by the infrastructure that has been built up all across the country, specifically the electrical grid and our transportation system that transports food and supplies to keep 324 million mouths fed. Not even a nuclear strike upon a major America city would make America less governable than a total, nationwide grid down scenario and while protesters in the streets or screaming helplessly at the sky won't knock the power grid down, should anti-America groups such as antifa or refuse fascism BE working with groups such as ISIS or al-Qaeda, with obvious massive backing of people such as George Soros, who knows what they are REALLY capable of. As we hear in the final video below from Skywatch TV featuring Dr. Tom Horn, Pastor Carl Gallups and Lt. Col. Robert Maginnis, the 'deep state' agenda to take down President Trump runs deep and with it starting to look like either Hillary will go down in flames or President Trump will somehow be taken down, we'll put our money on Hillary wearing an orange jumpsuit though we won't be holding our breaths, just waiting for that to happen. With many within antifa/refuse fascism simply 'ignorant tools' of the 'deep state' agenda as we read in this excellent story at Fox News, watching what they're doing will tell us a lot about what the 'deep state' is thinking as they further maneuver in their ever-increasing failure to 'take down' President Trump and America. Will antifa shut down America or scurry away like rats off a sinking ship? 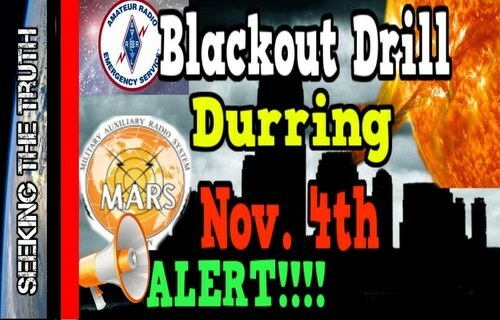 In the 2nd video below, videographer Truth Unveiled shares with us the truth as they see it about the DOD's nationwide grid-down drill happening on the same day that antifa has pledged to begin their mission of 'taking down President Trump'. In closing, we'll share with you comments recently made by staunchly anti-Trump Hollywood actor Bryan Cranston who had some unusually sharp words for those in America who want President Trump to fail. We'll not mince his words. Though particularly outspoken against Donald Trump pre-election, in which he likened him to a "demagogue", Bryan Cranston has now admonished those who actively hope he fails as president. Speaking to The Hollywood Reporter, Cranston confessed that "Trump is not the person who I wanted to be in that office, and I've been very open about that." However, now that Trump is president, he believes, "if he fails, the country is in jeopardy." "It would be egotistical for anyone to say, 'I hope he fails.' To that person I would say, f*ck you. Why would you want that? So you can be right?" he said. Isn't it time that ALL Americans get behind President Trump and his 'America-1st' agenda for America? And why would the deep state want President Trump's 'America-1st' agenda to fail unless they had something sinister in mind?